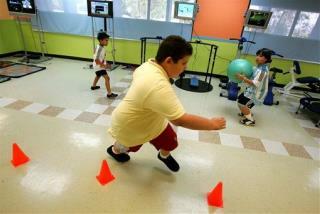 (Newser) – Legislators in Puerto Rico are debating a bill that would fine parents of obese children up to $800 if they don't lose weight. The bill aims to improve children's well-being and help parents make healthier choices, Sen. Gilberto Rodriguez said in a statement issued Monday. If approved, public school teachers would flag potential obesity cases and refer them to a counselor or social worker, depending on the severity of the case. Health Department officials would then meet with the parents and determine whether the obesity is a result of bad eating habits or a medical condition. They also would create a diet-and-exercise program combined with monthly visits to ensure it's being followed. Next on Newser: Quit, Comedy, or Comeback: What Next for Brian Williams? What about fines for obese lawmakers, who sit around on their fat asses soliciting legal bribes all day? Will making the family pay a fine change anything? How about more time for recess, smarter food choices, smaller meals, less sugary drinks, incentives for living a healthy lifestyle. Getting families and even schools to do this together builds a team, a focus, a support system. We all need to be better role models. Our favorite family activity is jumping rope, it is fun, a great cardiovascular activity, portable and suitable for all ages. We would love folks to get jumping with one of our handmade jump ropes, check us out on Etsy. Even though I regard myself as a Libertarian and oppose any governmental intrusion into our private lives, this idea intrigues me. We have mostly curbed tobacco use by demonizing the tobacco industry, taking away their right to advertise and essentially making smokers the equivalent of modern-day lepers. Would McDonald's and Coke stand for the kind of treatment Phillip Morris has endured? As far as I'm concerned there is no difference between the three companies.